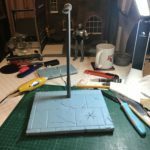 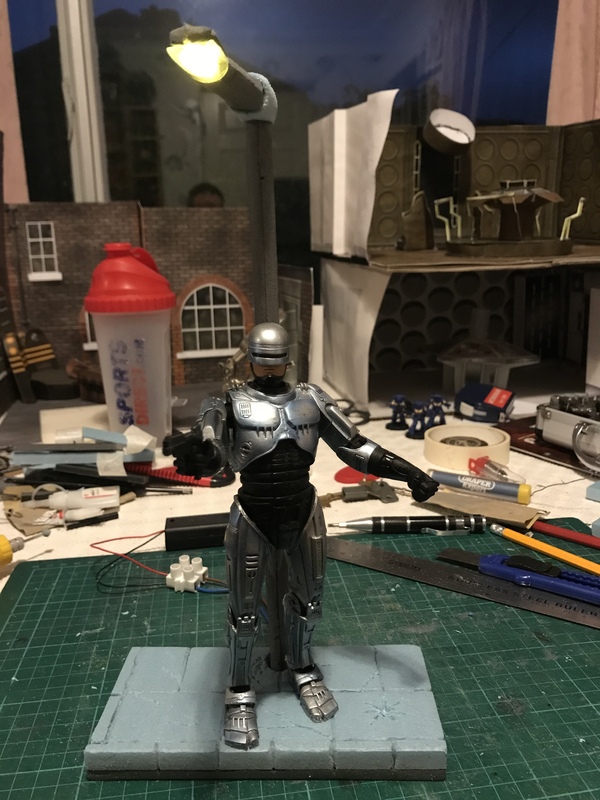 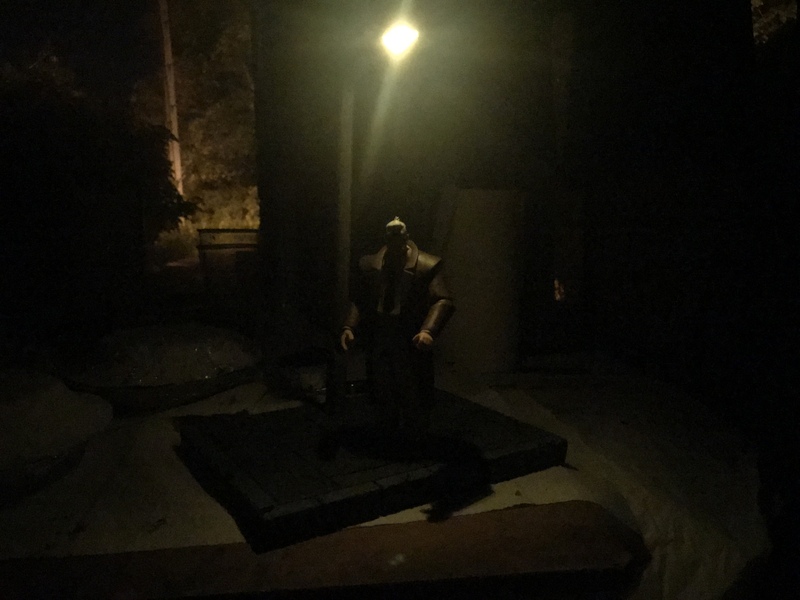 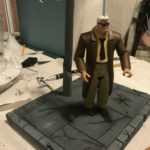 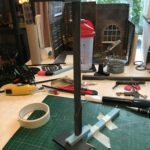 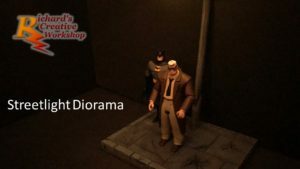 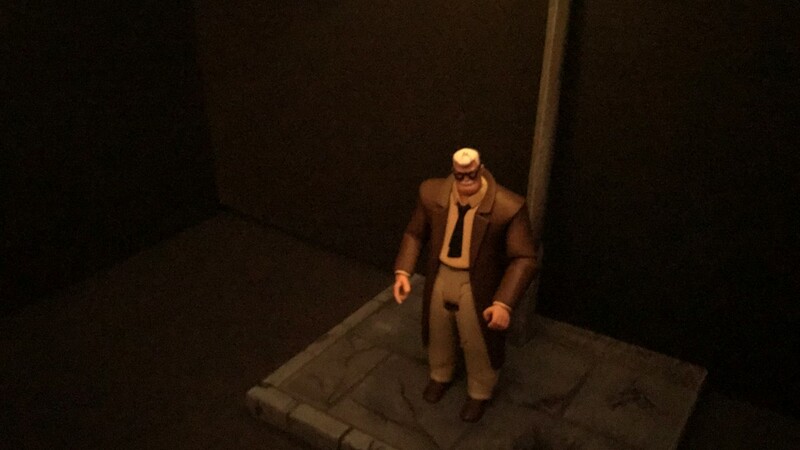 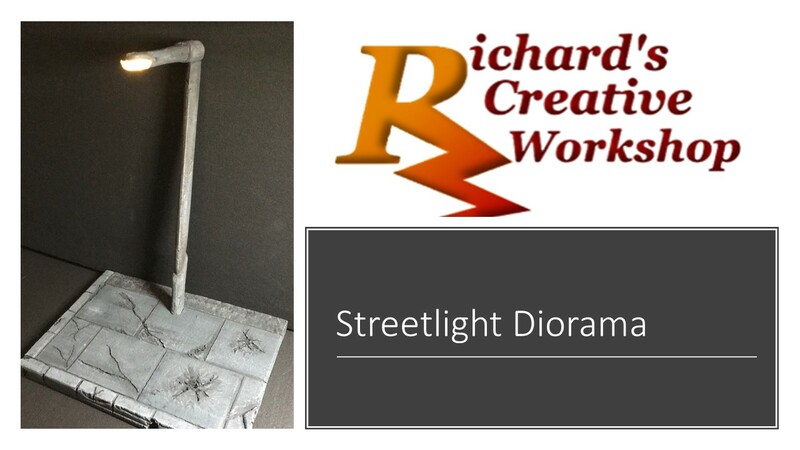 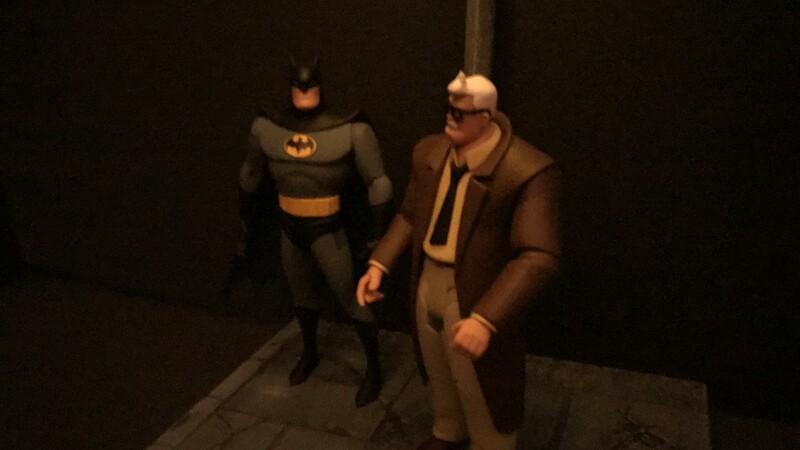 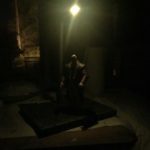 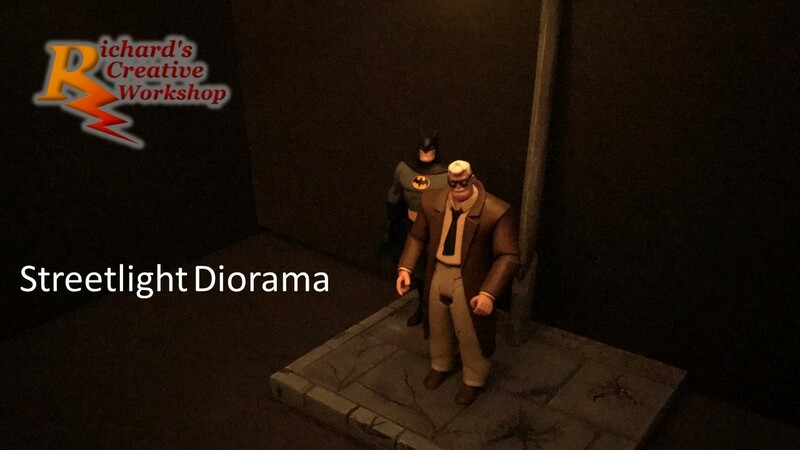 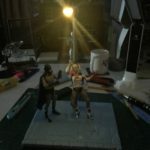 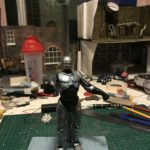 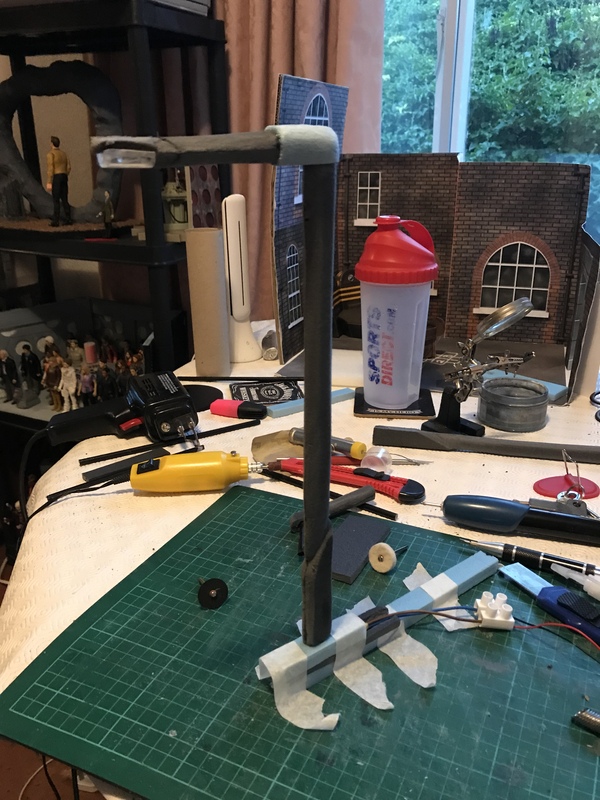 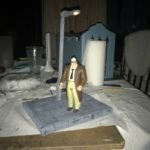 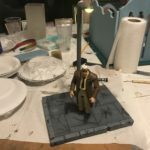 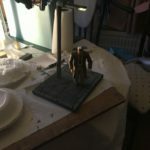 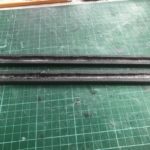 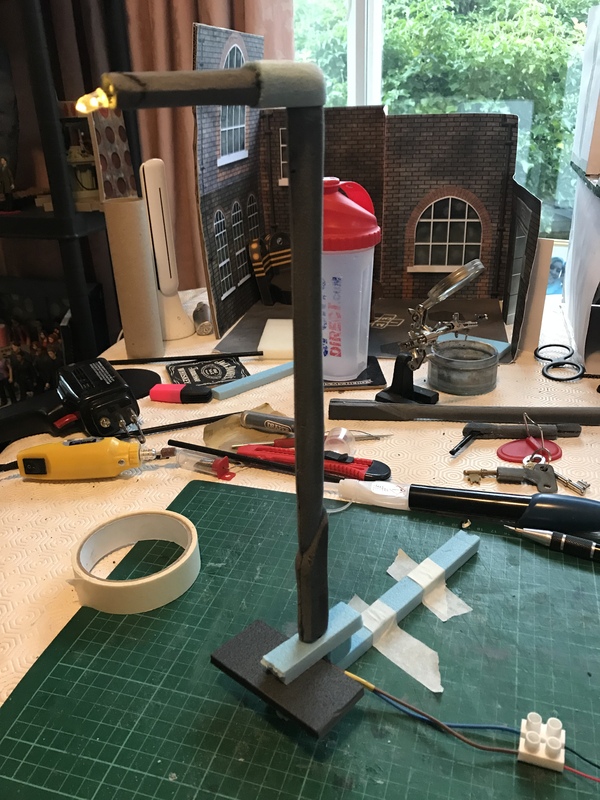 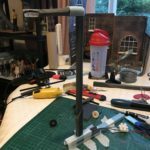 I was recently contacted and asked to make a street light as a bolt on to a clients existing diorama . 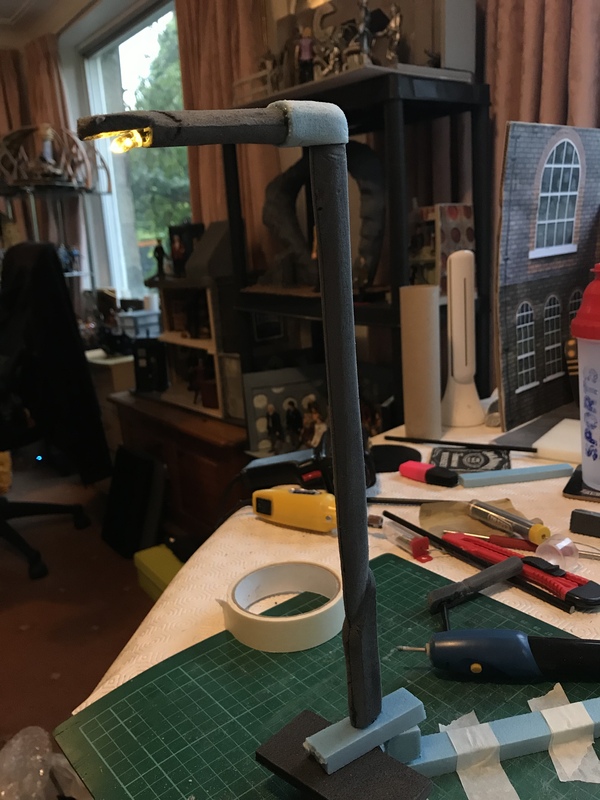 The street light is made from 6 mm foam board strips, the centres sanded out for the LED’s cable. 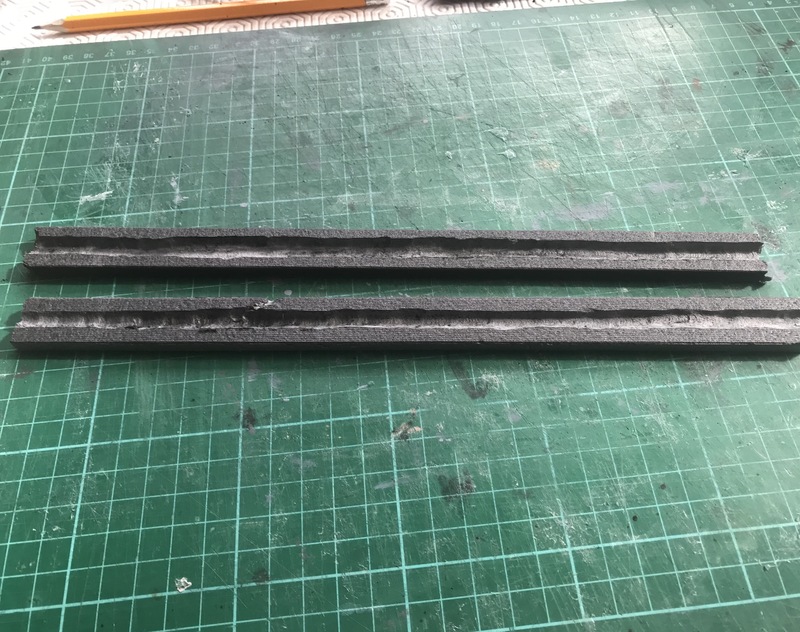 I glued the two strips together, sanded it down giving it shape. 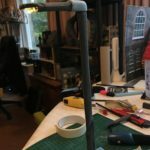 Repeating the same process with corner and the lights neck. 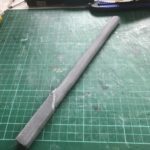 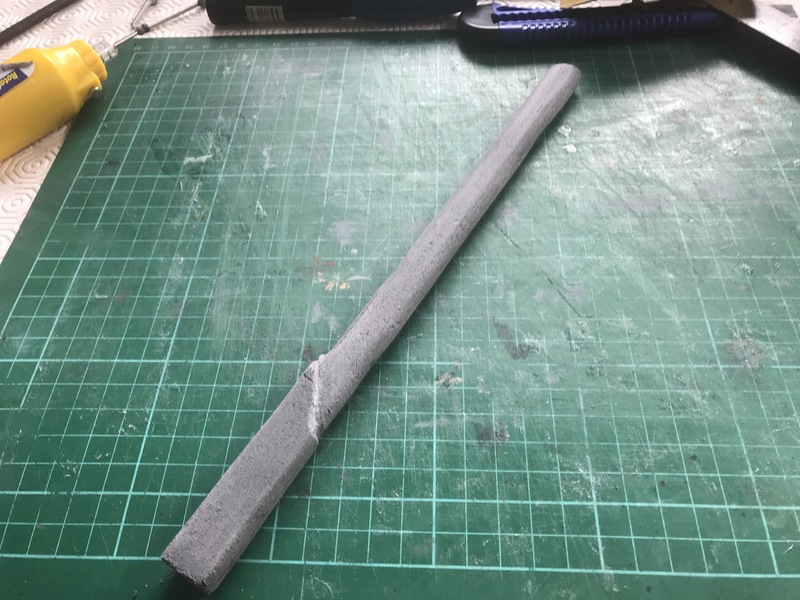 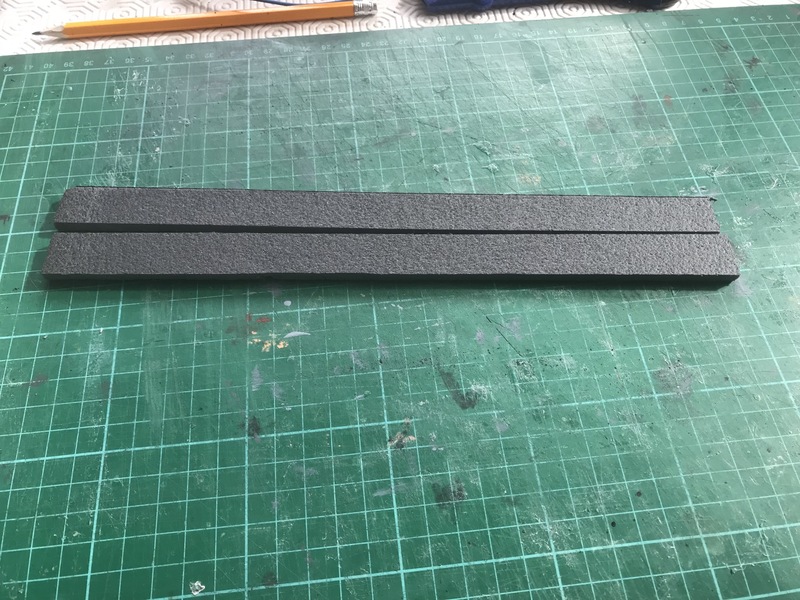 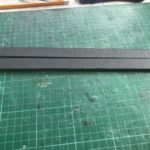 A small piece of foam cut for the light cover and using a small plastic tube to complete the street light. 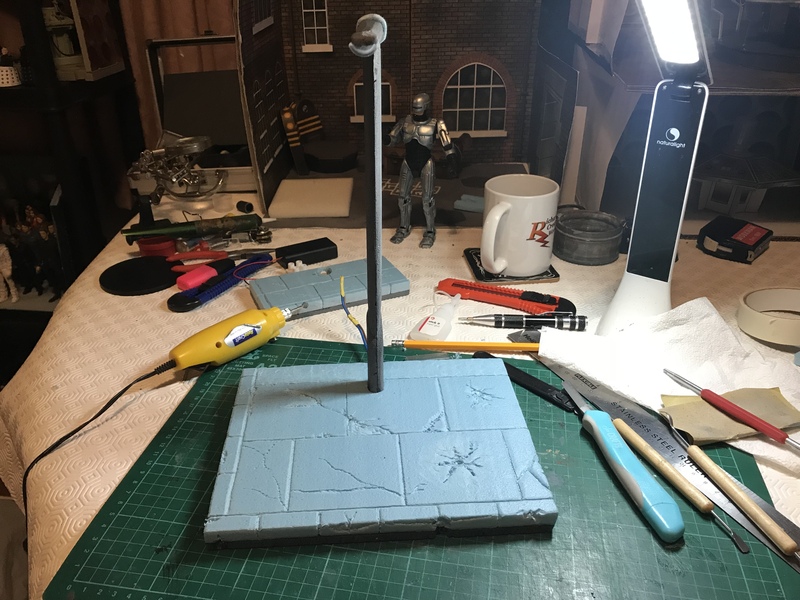 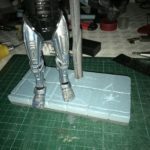 I have also been asked to make a removable base for the light. 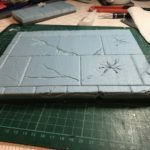 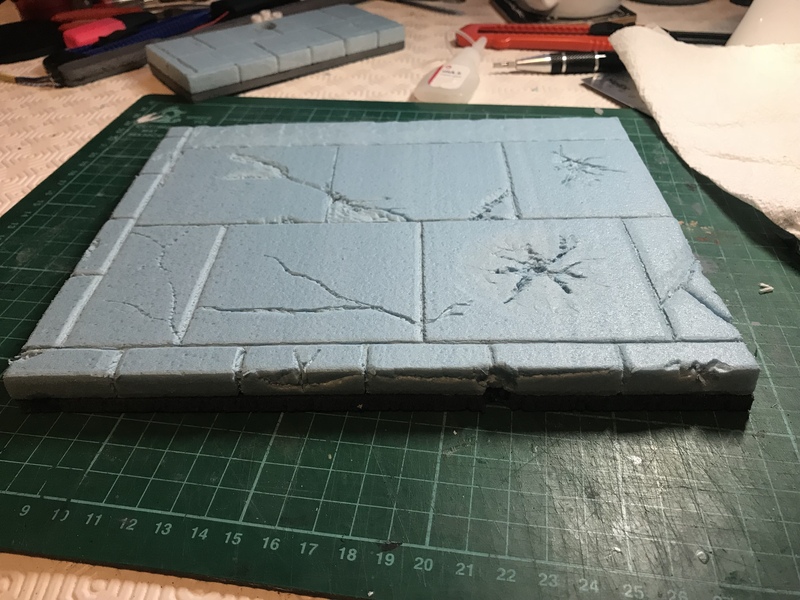 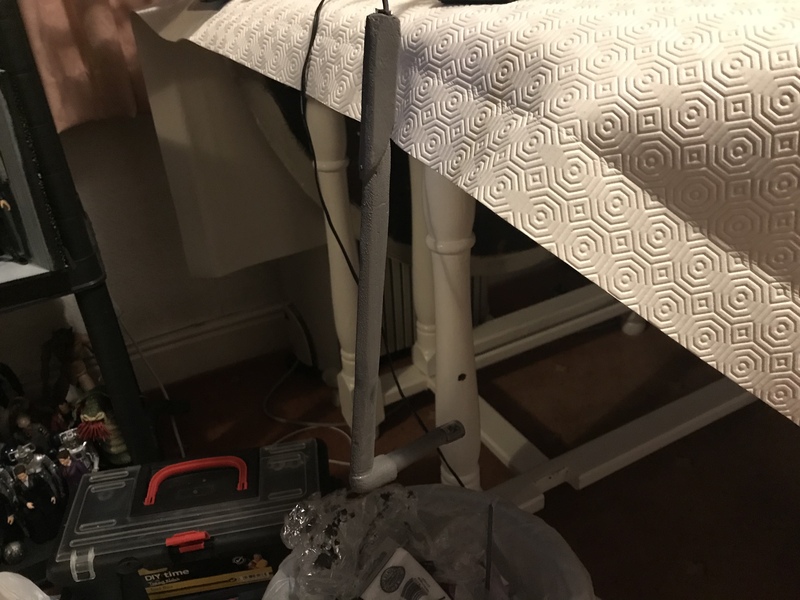 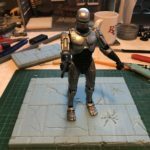 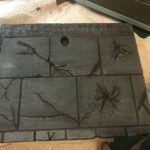 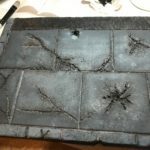 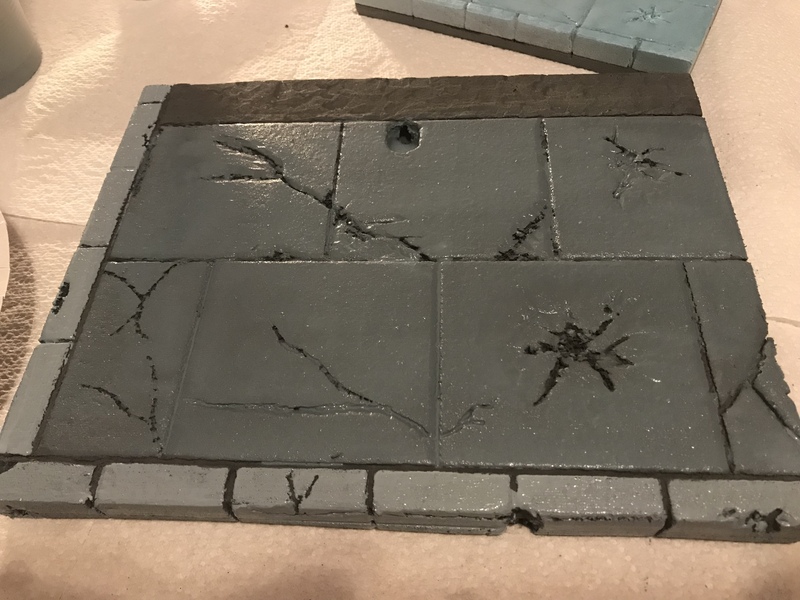 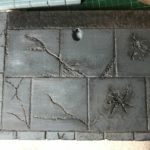 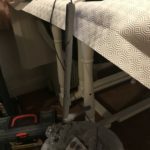 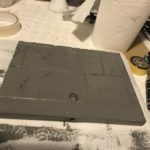 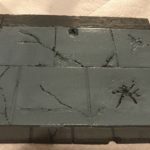 Using both 6 & 10 mm foam boards, glued together and paving stones etched in the foam with a cable run drilled through the foam. 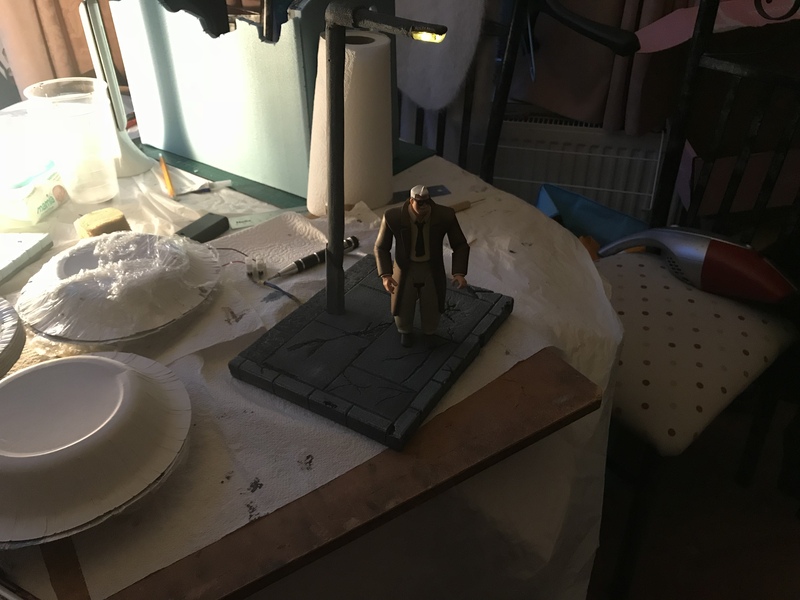 I might redo this base to make sure the light fits slots into it more securely. 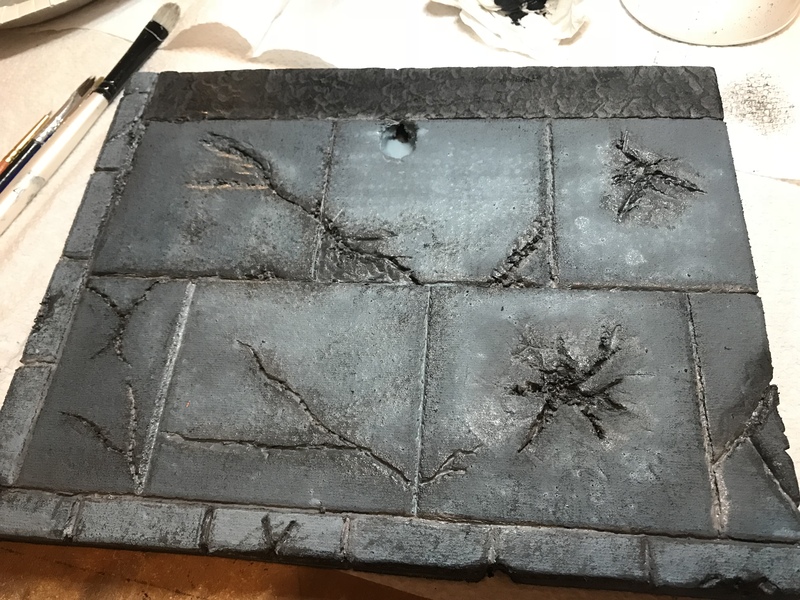 I decided in the end to completely remake the base, I was just not happy with it. 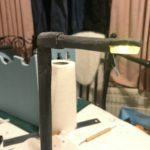 The new one is double the size of the original with a hole big enough for the streetlight to sit securely in it with a cable run drilled in between the two layers of foam board. 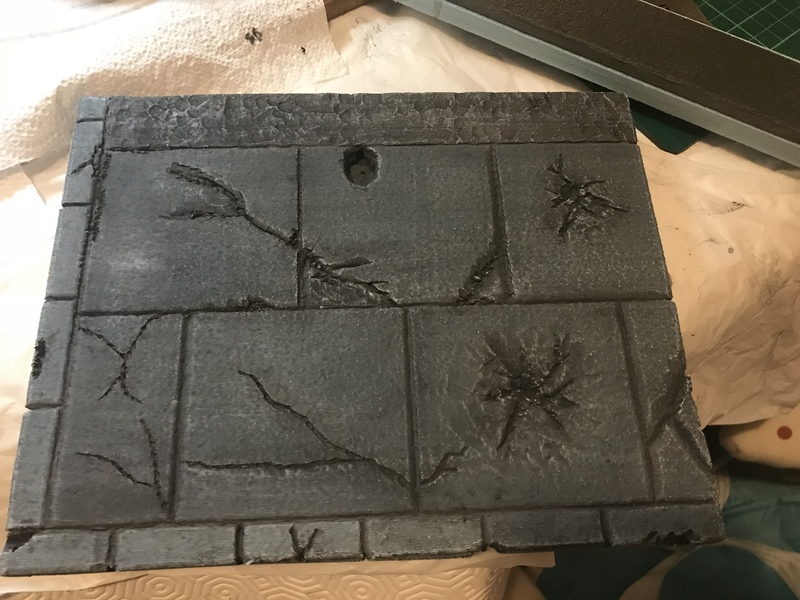 Pavement flags and curb stones where etched into the board, then damage was applied to the flags. 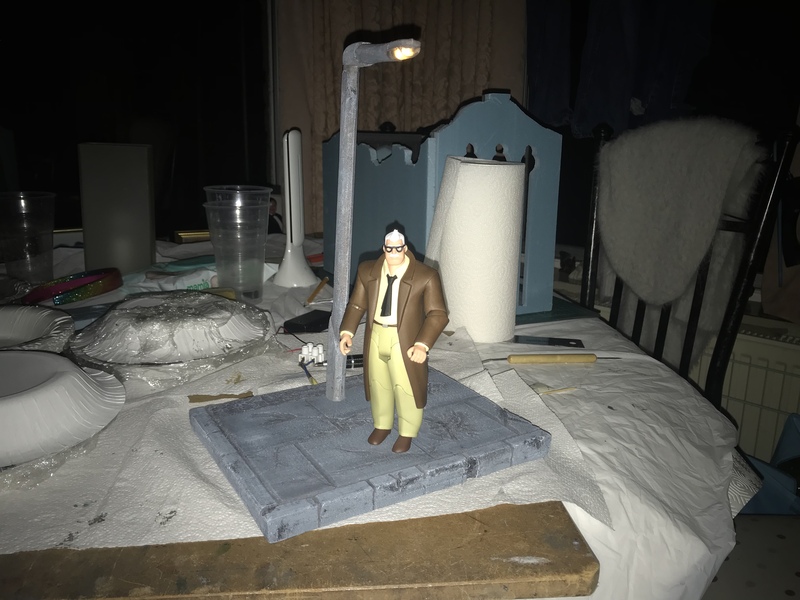 Satisfied with how this turned out, I applied the first coat of paint to the streetlight and base. 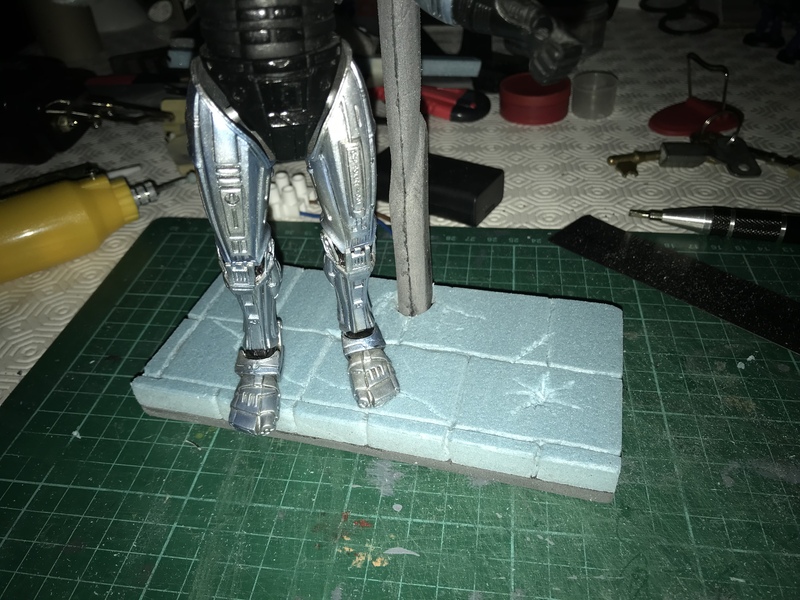 When the base coat had dried I went over the paving slabs with a light blue/grey, the curb using a light grey. 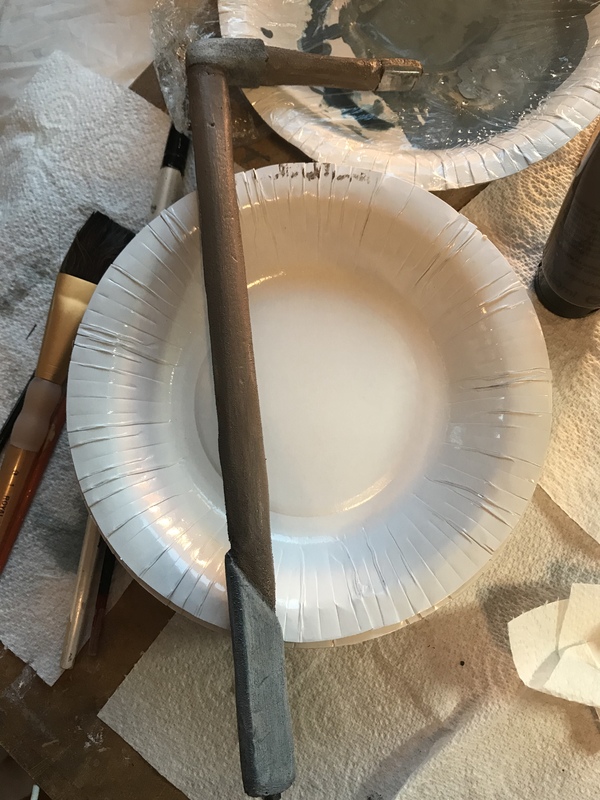 Taking a fine brush I painted in between each slab and crack with a dark brown. 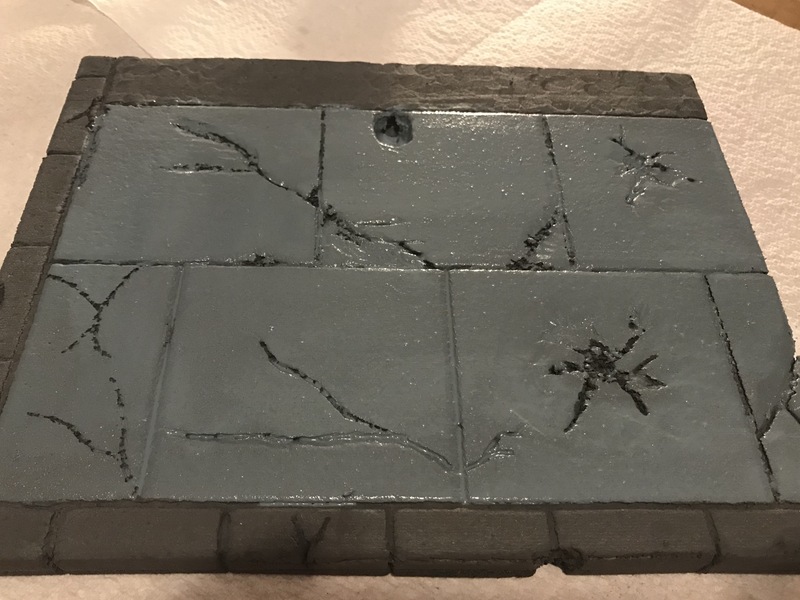 I dry brushed a dark grey over all the cracks, the tarmac at the back and the edges of the curb. 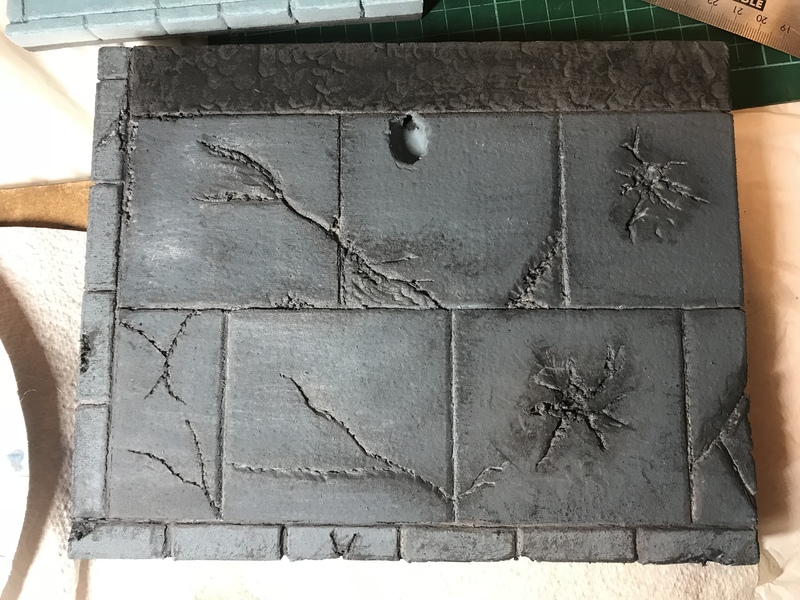 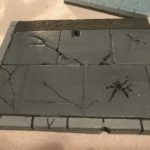 Using a thin brush to dab black into all of the cracks, dry brushed black over the tarmac at the back, dry brushed white over each of the paving slabs to complete the base of this piece. 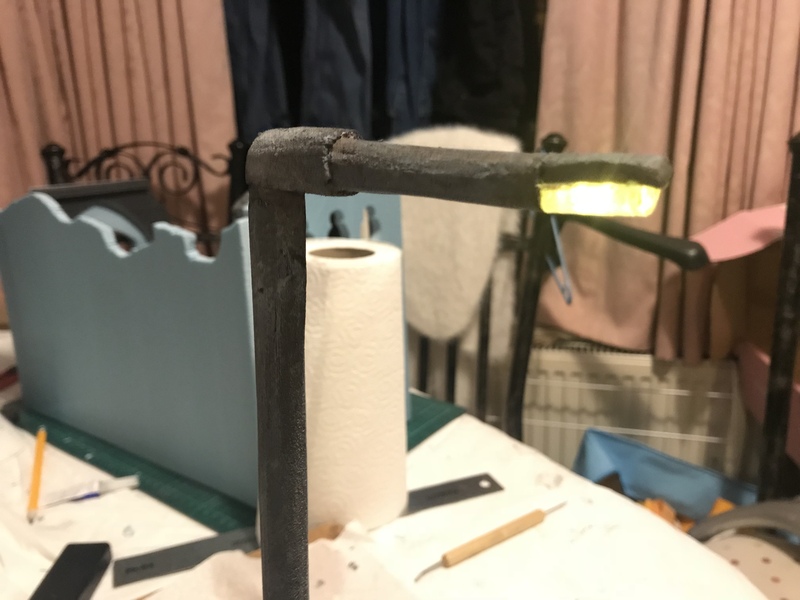 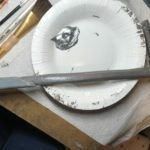 While this was drying I turned my attention onto the lamppost, painting the bottom and the neck join using the light blue grey, then the rest of it with a light brown, with a coat of metallic silver cover it. 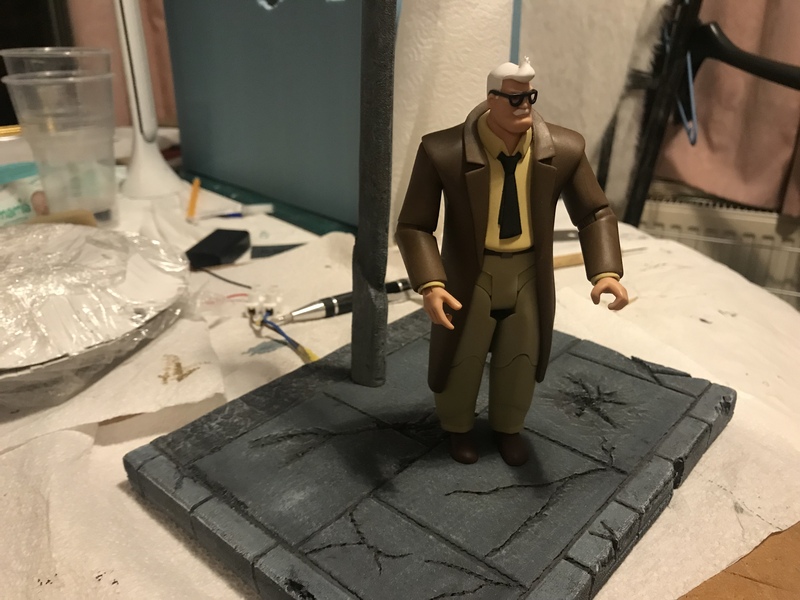 After it had dried, I was not overly happy with how it looked so I mixed up a lighter brown and went back over it. 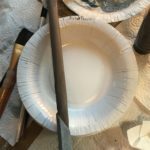 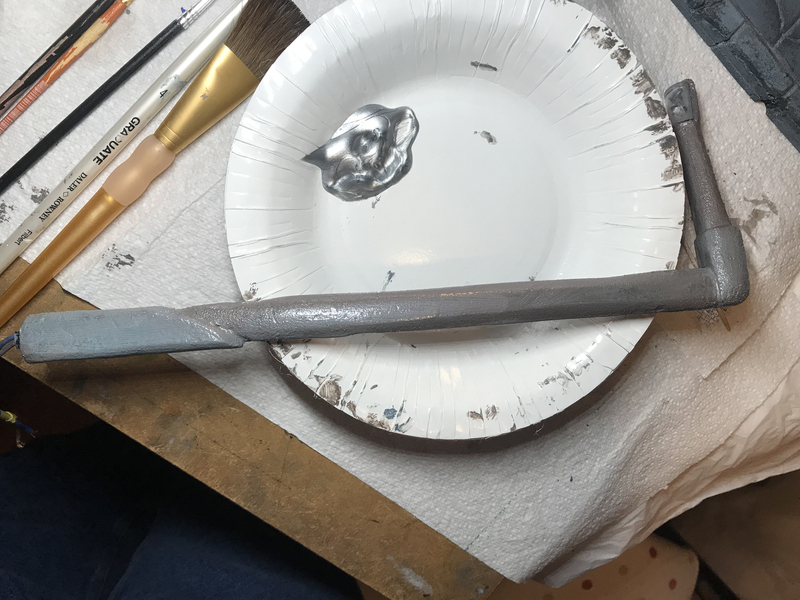 While it was still wet I added a light coat of white and blended it in. 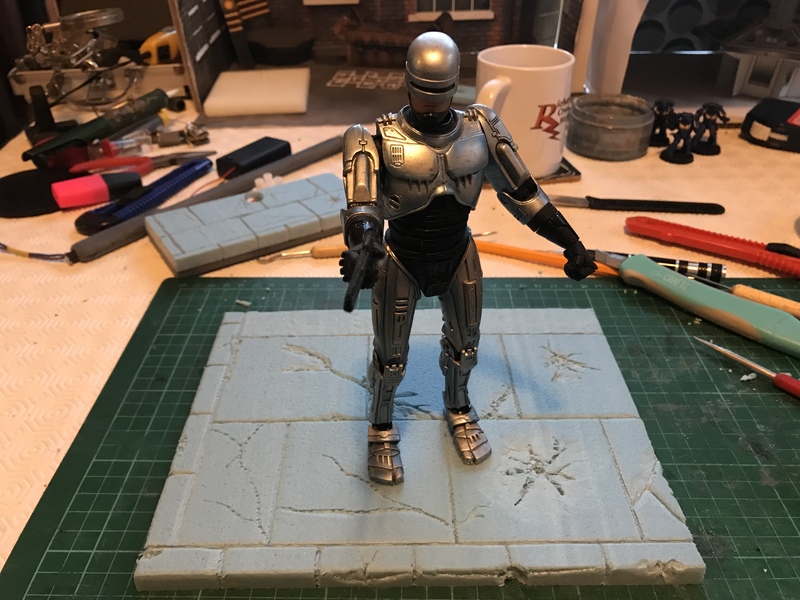 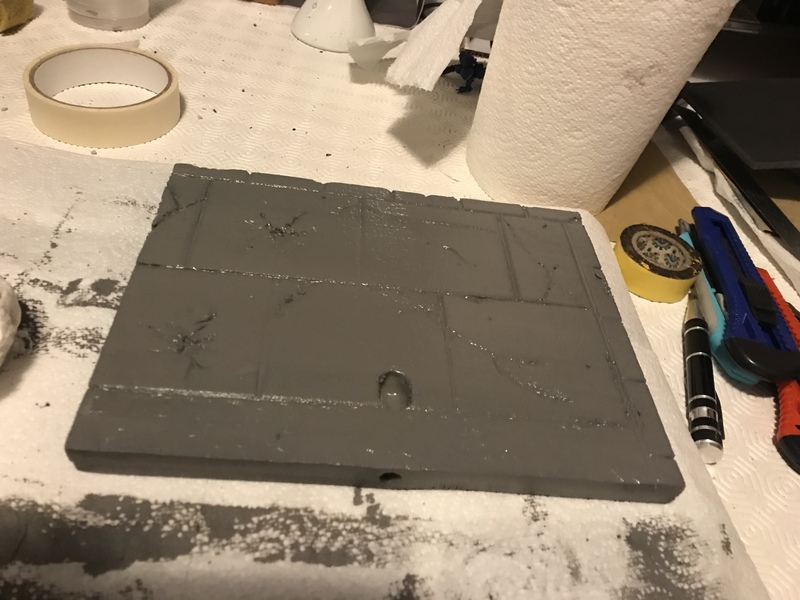 I turned my attention back to the base and dry brushed white across the entire surface and edges, the effect I have to say I am rather proud with how it turned out! 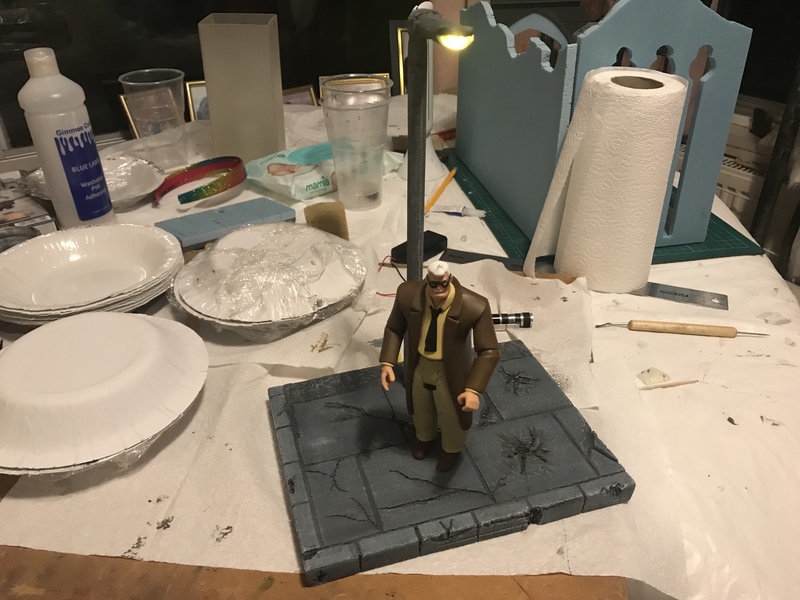 Turning back to the lamppost I dry brushed a light grey over the body and neck, followed by white then finishing dry brushing black over the entire post. 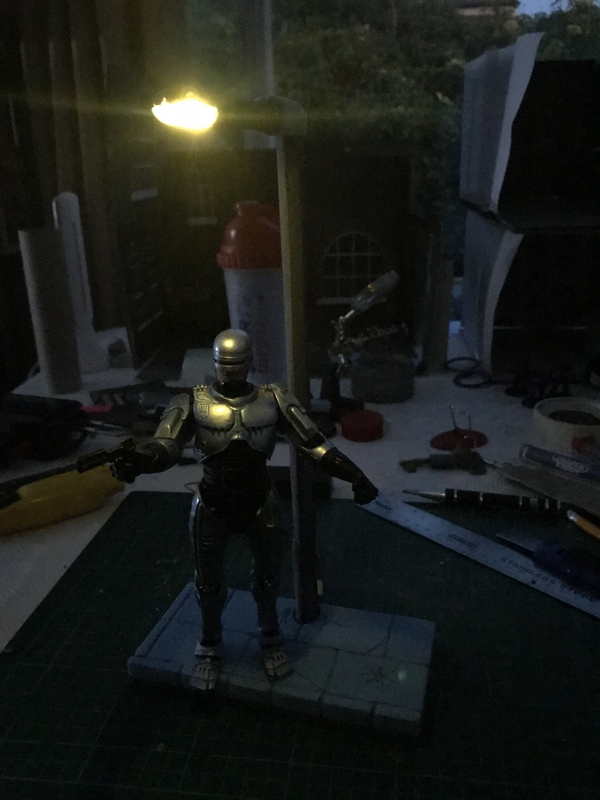 With lamppost finished, I have put both pieces together and here it is. 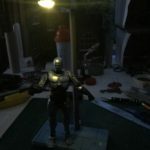 I will be putting up my usual final pictures soon. 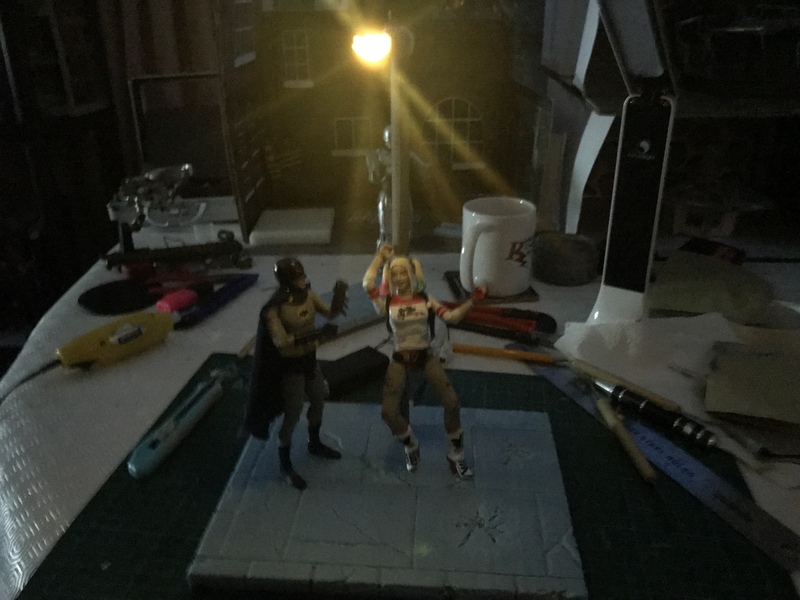 Final pictures of my Streetlight Diorama, the LED works a treat.